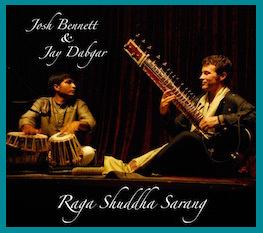 Use the controls below to listen to tracks from the album Raga Shuddha Sarang (2008). Alap - Slow unmetered impovisation unaccompanied by tabla, which introduces the notes and phrases. It then builds in tempo to fast rhythmic playing. Vilambit - A composition in a slow 7 beat cycle (Rupaktal). The sitar and tabla alternate as the lead instrument. Drut - A fast composition in a 16 beat cycle (Teental), increasing in tempo to a climax called jhalla.